Yunoka Furukawa and Satomi Nishimura make weight! Tomorrow Japanese fans in Saitama will get the chance to see a WBA Atomweight title fight, as 22 year old Yunoka Furukawa (7-1, 5) [古川 夢乃歌] battles 35 year old Satomi Nishimura (9-2, 1) [西村 聡美] for the now vacant title. Today those two fighters weighed in and both made the 102lb limit On the scales the older woman was the heavier fighter, coming in around 101.6lbs, around the same weight as she was in her previous world title bout against Ayaka Miyao back in 2014, a bout that saw he suffer a 10th round TKO defeat. As for Furukawa she was marginally lighter at 101.4lbs, which is a career lowest by more than 2lbs, and is amazing 10lbs lighter than she was for her last bout. Despite the substantial loss of weight she does look in great condition and seemed very confident of over-coming her more experienced foe. Every so often we get shows leaked by ticket websites, and it appears t.pia.jp have done it again with the leak of double world title show set for August 13th at the Soka City Culture Hall in Saitama Prefecture. Although the show hasn't been officially announced it seems tickets were made available at the start of this month for the show which will be headlined by an IBF Female Light Flyweight Naoko Shibata (15-3-1, 4) [柴田 直子] defending her title in a rematch against Mexican foe Maria Salinas (11-4-3, 4). Shibata and Salinas fought to an action packed split decision draw last year, with Salinas's team believing she had deserved the win and if pia are right the rematch will allow the fighters to work who is better in the ring. For Salinas a rematch would be her third world title out and her third bout in Japan, where she has drawn with Shibata and been beaten by Etsuko Tada. As for Shibata the bout will be her 5th defense, and see her back in the ring 4 months after fighting a stay busy bout with Tanuthong Sor Kunlawong. The other title bout, according to Pia, will be a WBA female Minimumweight title bout that will see Satomi Nishimura (9-2, 1) battle against Yunoka Furukawa (7-1-2, 5) for the vacant title, which will presumably have been vacated by Anabel Ortiz come fight night. For both Nishimura and Furukawa the bout will be their first world title bouts, though both have won regional titles recently Nishimura claiming the PABA female Light Flyweight title last December and Furukawa claiming the OPBF crown this past February. Again it must be noted that Pia are selling tickets despite their being no formal announcement of the show. This may mean that the card won't take place or it could mean Pia have jumped the gun and that is set to be announced very shortly. 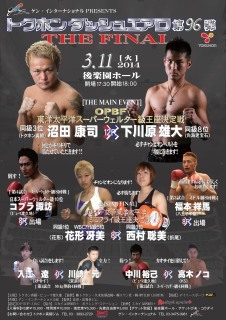 Today saw the announcement of a brilliant looking OPBF title double header for March 11th. The lesser of the two bouts is for the vacant OPBF female Minimumweight title as former WBC Atomweight title challenger Saemi Hanagata (8-4-2, 3) takes on the unbeaten Satomi Nishimura (6-0, 1). On paper this looks like a bout that you'd favour Nishimura in, though she has only faced 2 non-debuting opponents in her 6 bouts and she has fought at a much lower level than Hanagata. Hanagata, for her 4 losses and 2 draws, has competed with the likes of Momo Koseki, Masae Akitaya and Yuko Kuroki, all of whom are better than anyone on Nushumura's record. The better bout, at least for us, is the fight for the vacant OPBF Light Middleweight title. The belt which was recently given up by Charlie Ota will be fought for by former Japanese Welterweight champion Koji Numata (21-7-1, 16) and the freakishly tall Takehiro Shimokawara (19-8-2, 6). For Numata this will be his second attempt at the OPBF Light Middleweight title having been stopped in 9 by Charlie Ota last June. It'll be that experience, and the fact he was once the Japanese Welterweight champion, that will see him as the favourite going in. For Shimokawara, who will have a 3" or 4" height advantage, this will be his first title fight of any type. He'll go in as the clear under-dog though will be hoping that he can make the most of his height advantage to neutralise Numata's power which has stopped the likes of Tadashi Yuba and the then unbeaten Yuichi Ideta. Although both titles are vacant they are both intriguing match ups.